The Health Aggregator Manager (HAM) project, developed by the Center for Strategic Health Technologies (NUTES), from Paraiba State University (UEPB), Campina Grande, Brazil, in partnership with Signove Technology S/A and LIFEMED Medical Devices, aims to create a high-level system that serves as a managing interface of medical measurements, taken by devices that comply with the ISO/IEEE 11073 standard, using the Antidote, which is a set of free libraries that implement the standard. The contribution is to present a reference architecture and implementation for an open cyber-physical system, with sound documentation and practices. 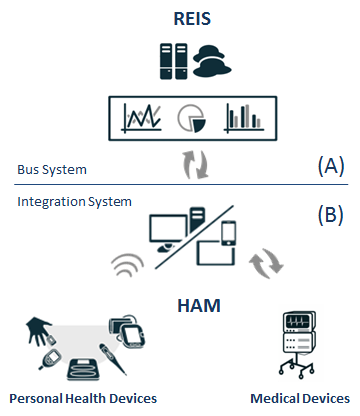 The HAM was developed using agile practices and a requirements-based engineering approach. This mixed approach satisfy safety requirements defined by this type of health/medical system and enables the demonstration of compliance with main software standards.